Apple announced yesterday the new AppleTV. Let’s call it AppleTV take two. The new AppleTV leverage the Apple A4 processor found in the new iPod Touch, iPhone 4 and iPad. This make the AppleTV the forth platform based on this processor. I speculate that the new ATV platform is also running a variant of the famous iOS running on all other hardware using the A4 processor. This is the only sensible conclusion that one can make. Why would Apple develop a new OS for the A4 processor when it already has a successfull and expendable one with iOS. 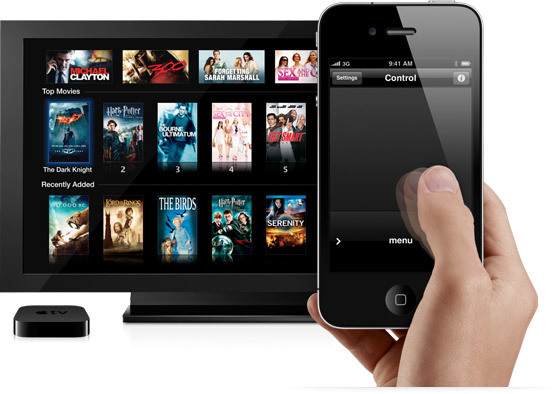 This make the new AppleTV solution a single application based solution on top of iOS 4.x. I reckon that Apple could easily change this and allow the platform to leverage the App store to “augment” the offering. In my mind this is the only way Apple can turn the “hobby” in a fully viable commercial solution. With an iOS underpinning Apple will be able to quickly add new features to offer a leading advantage over the Rocku and GoogleTV platform. I expect many updates to come for the platform to add features like “content search”, DVR integration over the network or attached hardware (why do you think Apple left a diagnostic “USB” interface on the unit?). Not because they needed it to diagnose problems… but rather such that they can use it to eventually expand the ATV solution. Could this port be used to drive an external DVR appliance that would record TV shows? This would make sense given that Google is touting integration with customers DVR. At the moment the product make sense to watch movies, TV shows, listen to music and watch photo… but it could do much more. Given that Apple included enough flash memory the ATV hardware could do whatever the iPod/iPhone can do this thing could do too. Think weather application, games, internet surfing, social network integration. Anything that does not require too much typing is possible here via the simple included remote. Pair the unit with an iPad or iPod/iPhone device (existing Remote application) and you now have a terrific combo for gaming with powerful multi-touch and gyro controllers. The 1st integration of this can be seen with AirPlay. I am sure there will be many more coming over the moths to come. So what do I wish Apple will do? It really boils down to one thing: allow developers to write application for the Apple TV and distribute them through the App store. It does not need to look like the existing iOS GUI. It could be build within the Apple TV UI. Just add an application section. If Apple does this it would be killer solution. Apple probably want to do this but is not just ready yet. Think of the original iPhone release when you could only get Apple’s own application for it… Now think Apple TV. Google foray in the TV space probably took Apple by surprise and they have been scrambling to put to market the product 1st, beating Google to the finish line. They will now take some time to rest and come up with a well taught through solution for and Apple TV application store offering. New UI guidelines, API, etc. This thing isn’t like a phone, it is a 32+ screen system… so it deserve new UI elements and guidelines. What was good for the iPhone/iPad won’t work for it. Let see where the Apple TV take 2 is a year from now. I bet it will be a LOT better. Until then, enjoy the revolution through your new Apple TV. At 99$ I know I will get one and see it evolve over the years, thank’s to Apple frequent free upgrades.